Monin Amaretto syrup in 70cl stylish glass bottle. Monin Amaretto syrup is based on the classic Italian sweet, almond-flavoured liqueur. Characterised by the distinctive flavour of the 'mandoria-amara' or bitter almond, the name Amaretto means 'a little bitter' in Italian. The similar consonance of amare and amore 'love' is responsible for the associations with romance. 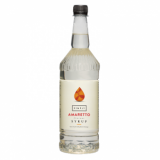 Amaretto has been known as a flavoured liqueur, which may or may not contain almonds. The liqueur is primarily made from apricot pits, and may contain other spices and flavourings. Monin Amaretto is a great alternative to the similar tasting liqueur.